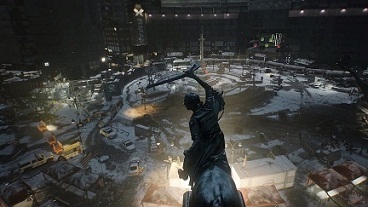 The free update 1.2 for Tom Clancy's The Division brings a new Incursion mission called Clear sky. The new mission leads you to Columbus Circle where Riker have occupied the air defense system. You task is to defeat the Riker threat in Columbus and to make the best loot. The free update also brings more high-end weapons and better equipment sets. With them, it should be easier to defeat the boss in a new incursion. Before we provide you with tips on tactics in the attack, we show you first, what you can expect in the Clear sky. Team Play: For the Incursion mission Clear sky you have a team of four players. Team’s waves: They are rare in the Incursion Clear sky. Here you expect new challenges. Checkpoints: After the first phase, a memory point has been set. There you will restart, should die. Difficulty: Once you get a high-end object (Gear score of 204) and a Set-Item (Gear score of 214). Difficulty Challenging: Once you get two high-end items (Gear score of 204) and a plurality of set items (Gear score 240). The Clear sky consists of two phases. The following tips will show you how you can survive in the hard mode. All the fun starts at Columbus Circle. Go there, where you will first spend a barrier and encounter many opponents. - Once you see two enemies with an orange diamond over the head, killing them. From them you will receive the necessary explosives to get through the barrier. - You see red circles on the ground, then you take care, because they highlight an enemy air attack, where you have to dodge. - Before Columbus Circle find its boxes where you should fill your resources. Here you can fill even your health packs. - It takes only one player to use the laptop in the middle of Columbus Circles. The others should keep clear the back or directing the shots. - The two fuse boxes must be transported to the destination. When wearing you will be usually slow. Therefore, the carrier should be protected by the other team members. - Again, you have to reckon with airstrikes, so don’t forget to dodge this. - Once you have served the laptop again, you have to face the final boss. Expect so that you can bypass his shield and focuses your shots to the final boss.